June 22 – The current boundary for severe storms will focus the energy around Chicago and the Mid West. This is around the edge of the Heat Dome that is locked over the western US and can once again lead to a large outbreak of severe storms with long tracks of damage to them. These will include large hail and tornadoes. The path will drop the cluster to the east and southeast… back in our direction. The NOAA Storm Prediction Center has highlighted the Moderate Risk region for severe weather today, and you can see the edge of the Slight Risk extends into central Maryland. But I want to highlight that the time frame extends to tomorrow morning. This is seen by the reach of the rain at midnight as shown by the NAM model. Most of today for our region should be OK. But tomorrow, the early morning will be our concern. The chance of the storm complex reaching our region will be closer to sunrise on Thursday. The bulk of the energy will arrive in the morning. While this is the most stable part of the day, there will be enough energy left over to lead to problems between sunrise, but likely done by noon. See the simulated radar below. Click here for our web store to get in on the special. Stars are flakes, and rulers measuring the piles make up the stripes display a few metaphors that might connect with you. Personal design of our flag with a snow theme to keep you cool in the summer heat. 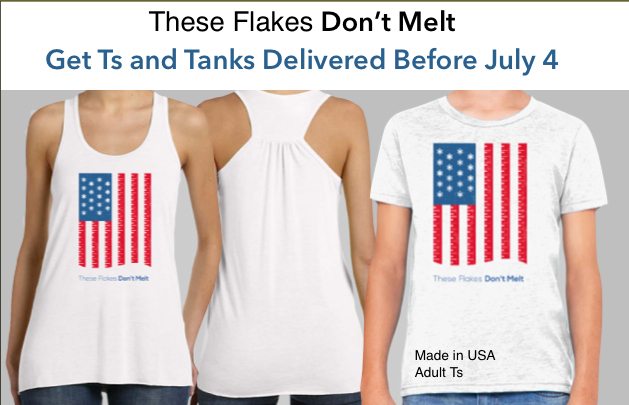 These are available for two weeks, so we can promise delivery by July 4. I am one flake that will not melt this summer as I train for my Trek Across Maryland Aug 7-13. Proceeds will support the preparation for this event and I thank you ahead of time. Click on our web store to order yours before June 29. My entire family will be sporting these for the fireworks. Will you join us?